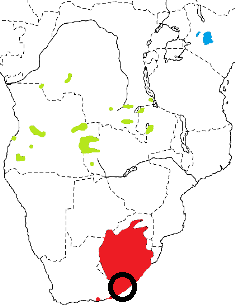 The Long-tailed Widowbird was formally named by Pieter Boddaert, a Dutch naturalist, in 1783. Boddaert published fifty copies of an identification table of EdmÃ©-Louis Daubenton's Planches enluminees, assigning Linnean binomial names (scientific names) to the coloured plates. Many of these names were the first scientific names to be proposed, and so they remain in use today. 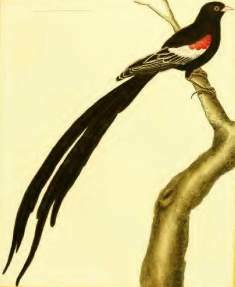 Georges-Louis Leclerc, Coount of Buffon was the first to describe the Long-tailed Widowbird, but he did not accept the binomial system of Linnaeus and so he is not credited as the formal author of this species. Buffon described many birds and other animals in a series of volumes (see here). The 9 bird volumes were published between 1770-1783 and Buffon commissoned Edme-Louis Daubenton, to supervise a book of illustrations - the coloured engravings by Francois-Nicolas Martinet were published in 1783 as Planches enluminees.